"One's a warrior. One's a wise guy. They're two L.A. cops going after a gang of drug lords. Feet first." 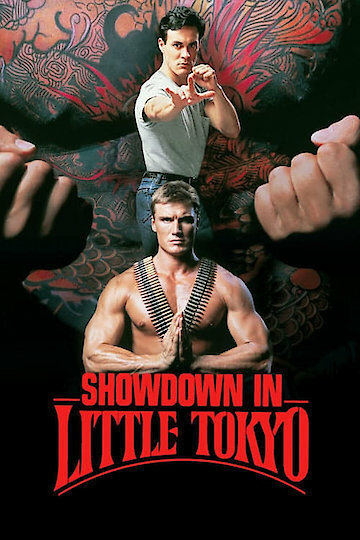 Showdown in Little Tokyo is a 1991 action based film. The film stars Dolph Lundgren as well as Brandon Lee. Brandon Lee is the son of the legendary Bruce Lee. Dolph Lundgren plays the part of a police officer named Chris Kenner. Chris Kenner is of American decent however he was raised in Japan. Kenner eventually meets John Murata played by Brandon Lee. John Marata is also a police officer that quickly becomes Kenner's partner and friend. The one thing the partners have in common is that they enjoy marital arts. The two police officers begin working in the “Little Tokyo” district of Los Angeles. The two end up watching a well known restaurant for possible criminal activity. Eventually an arrest is made inside of this restaurant. The accused is taken directly to headquarters to be booked. While the accused is waiting to be questioned by the two officers he commits suicide. The accused commits suicide by breaking his own neck. The two officers do have some regrets due to the fact that the criminal never paid for what he had done. This film is full of action as well a suspense. Showdown in Little Tokyo is currently available to watch and stream, download, buy on demand at Amazon Prime, Starz, Amazon, Vudu, Google Play, iTunes, YouTube VOD online.